Following wins over the Cornwall, Bristol and Torbay, the Saints picked up their 4th win with a one-sided affair over the league newcomers from Dorset. 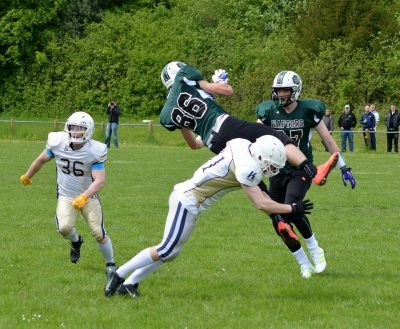 Following wins over Cornwall, Bristol and Torbay, the Saints looked strong going into this match up and have solidified their position at the top of the Division II – Southern Football Conference West. Marking their first home game at Dorchester Rugby Club, the Raptors attracted a good crowd but on the field they were outnumbered heavily. Kitting approximately just two dozen players, the Oxford side with a travelling squad of 60 had the advantage, along with the experience of a 30+ year history. Although confidence was high that the Saints would claim the win, the game was still vital. Oxford travelled in full force with their starting line-up alongside many newer players who could gain valuable experience. 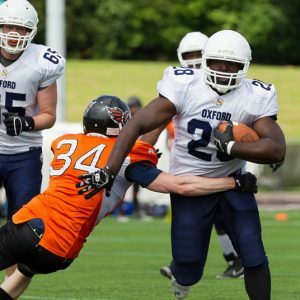 As a new team finding their place in the UK leagues, the Jurassic offense began with the ball but were promptly shut down by the experience of Oxford’s defensive unit. The defense was the stronger part of the Raptors and they managed to slow down the powerful Saints offense early on, who did not find the endzone on their opening drive. 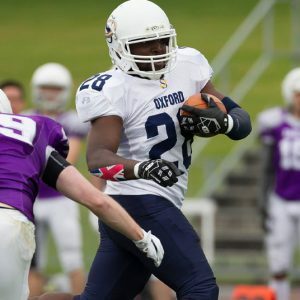 The first score of the game came shortly after with a 34 yard touchdown pass from Oxford quarterback Destin Maulding to James Walter, who evaded and outpaced the defenders. Sam Fielden kicked the extra point and the Saints took a 7-0 lead. Maulding completed another pass to Richard Bloomer for 37 yards, catching the ball in stride over the middle of the field and charging into the endzone. 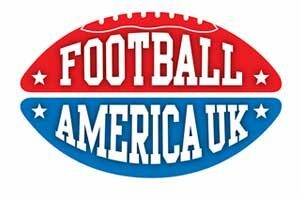 Another good kick by Fielden made it 14-0. In the 2nd quarter, the Saints continued to dominate on defense and limited the Raptors to minor gains. Most drives were ended quickly and the ball was returned to Oxford’s offense. Another good drive brought the Saints within scoring distance and Fielden took to the field for a 23 yard field goal which was good, moving Oxford to 17-0. The Saints continued to rotate in personnel against a struggling Raptors side with fewer numbers. Oxford added another 3 scores before the end of the half. Quarterback Destin Maulding ran in a 19 yard touchdown himself and then Grant Tebb when the Raptors punted the ball away and he returned it 45 yards and back to their endzone. Maulding added on a further score and ran into the endzone from 2 yards out. Fielden’s extra point kicks were good for all 3 scores and the Saints took a commanding 38-0 lead at half time. 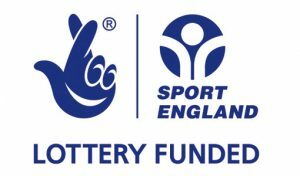 League rules required a ‘running clock’ as one team had a significant point advantage over their opponent and this came into force at the beginning of the 2nd half. This controversial rule meant normal clock stoppages were not observed and is intended to ease the suffering of teams being overpowered, reduce the risk of injuries and significantly cuts the amount of playing time. With Oxford’s coaches continuing to rotate players and experiment with different plays & formations, hard running from Antonios Athanasiou saw him making ground and the Raptors defense had trouble bringing him to the ground. Athanasiou punched the ball in for a 6 yard touchdown but Fielden’s kick was blocked, 44-0 Saints. Knocking at the door again, the Saints were a short distance from the endzone and Maulding completed a short 2 yard pass to Richard Bloomer for a further score. Fielden added the extra point and the Saints moved to 51-0. 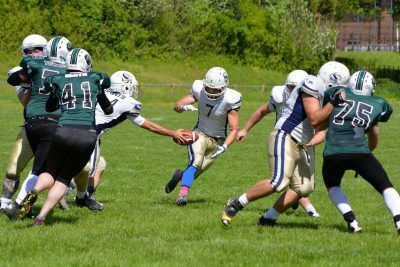 With further rotation and the running clock continuing to speed up proceedings, rookie quarterback Kyle Swann took to the field for Oxford to close out the game. Performing well in game conditions, Swann evaded Raptor claws and also completed a great pass to receiver Sam Armstrong, who went up high over his opponent to bring in the catch. 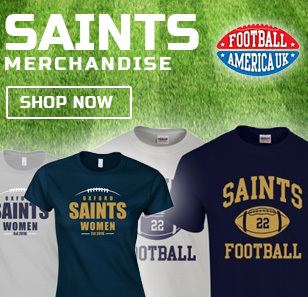 The Saints firmly controlled the day with a balanced display of 194 rushing yards and 146 passing yards. 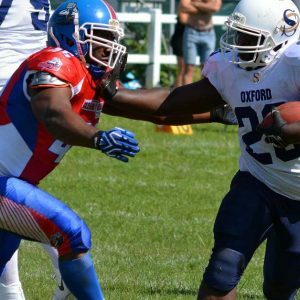 This combined to 338 total offensive yards for Oxford compared to -7 for the Raptors (after taking into account tackles for losses/penalties). 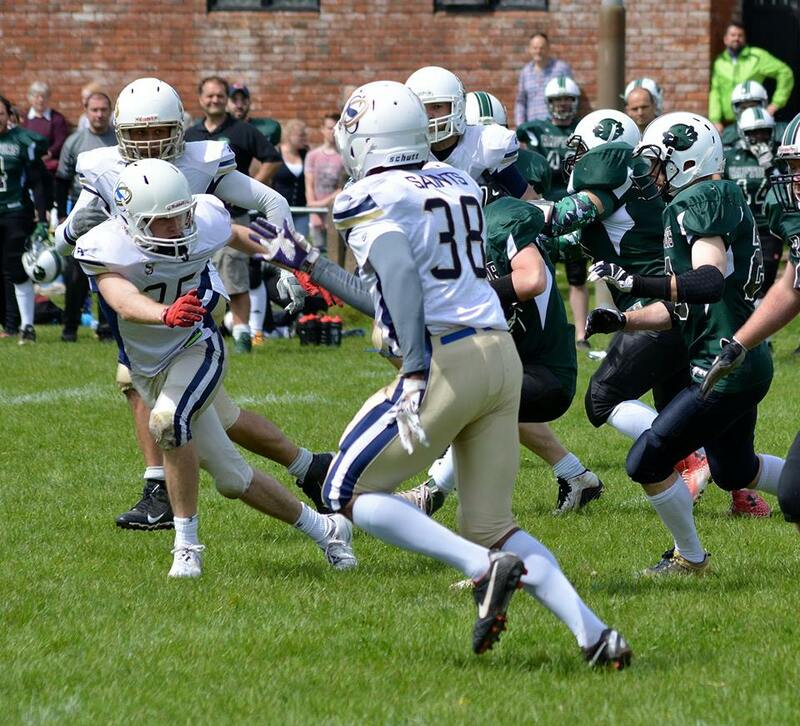 Running back Kevin Brooks led the way on the ground with 46 yards on 7 carries, with further carries distributed well amongst his fellow running backs Antonios Athanasiou, Robert Johnson and others. Tight end Richard Bloomer hauled in 4 receptions for 58 yards and 2 touchdowns (later being named Team MVP for his contributions). Tight end/running back James Walter added another touchdown reception for 34 yards and only participated in the first half. Quarterback Destin Maulding had a solid performance with 12 passing attempts and 7 completions for 127 yards (58% completion rate) with 3 touchdowns. 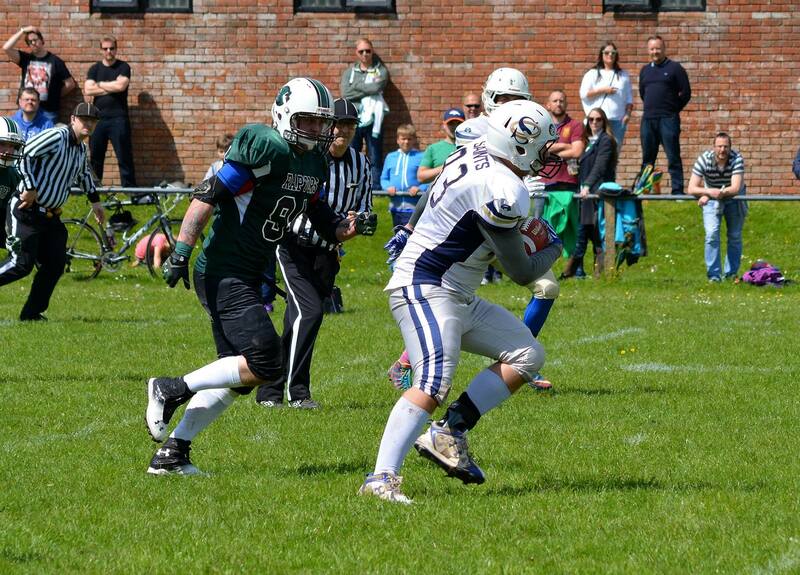 He also picked up 43 yards on the ground and ran in 2 further touchdowns. Grant Tebb returned 3 punts for 83 yards including a 45 yard touchdown return. On defense, tackles were widely distributed with heavy rotation. Linebackers Spencer Duffy, Eric Mendoza and defensive end George Wright led the day with 5 tackles each. A total of 6 sacks came from Duffy, Mendoza, Calvin Holmes and Sam Stancombe. Cornerback Mike Turner claimed an interception and returned it for 24 yards. 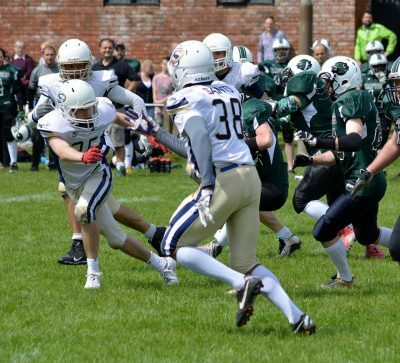 Although a one-sided affair, the league newcomers from Dorset will continue to develop their skills and recruit new players as the season progresses. 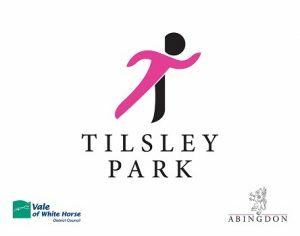 The Raptors take on the Saints again on 31st July for the return fixture when they travel to Tilsley Park, Abingdon. 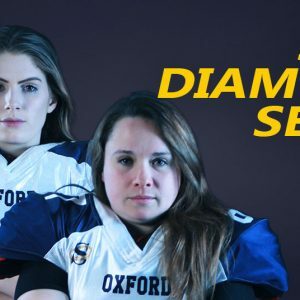 Oxford now sit at 4-0 and have two weeks of training before they travel to take on local rivals the Swindon Storm on 12th June, in a highly anticipated fixture. Swindon were widely believed to be a strong contender for playoff football in 2016 and began the season with two wins over Torbay and Jurassic but then suffered two heavy losses at the hands of Bristol and Cornwall. With Swindon’s only wins coming from the two teams at the bottom of the conference, Oxford will be looking to secure their 5th win of the year and remain undefeated. 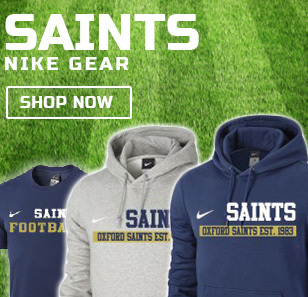 However in 2015, the Saints were riding high on an early-season winning streak and suffered a surprise defeat at the hands of Swindon, which will undoubtedly be in the minds of the Oxford Saints as they prepare to meet again.